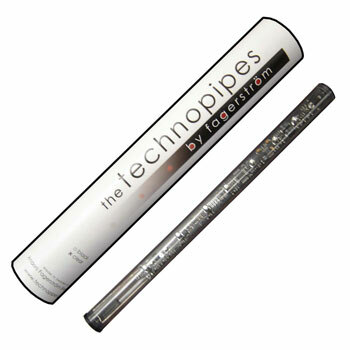 The TechnoPipes are a full size electronic Bagpipe is an ideal complement to your regular practice chanter. It comes complete with a set of headphones. This chanter uses earphones to hear you playing. This way you are the only person who hears you practice. It is perfect for practicing on bus's trains, in bed or at church! As well, this chanter is designed so that you can play a natural C or F. The precision of the electronics make this chanter unforgiving at detecting crossing noises. The unit is specially programmed to shut down after a period of inactivity to conserve battery power. The Biggest differences between the TechnoPipes and the TechnoChanter is that the TechnoPipes have a lot more options included in the unit. The additional options included in the TechnoPipes are; Authentic Highland Bagpipe, and two different smallpipe Sounds. Drone sound with optional E or D drones. A built in Metronome. Recordable playback capabilities, and Midi Output. This unit uses 1 AAA battery . The TechnoPipes is perfect for traveling as it will easily fit in your luggage without taking up too much room. Chanters are available in black, clear (pictured), or white. This chanter is a must for the serious Piper.